Two major developments this past week could see a large part of Judea and Samaria (West Bank) being reunified with Jordan – as existed between 1950 and 1967 – or becoming a Jordanian enclave – under President Trumps’ yet-to-be- announced “ultimate deal” intended to resolve the100 years-old Arab-Jewish conflict. The PLO refusedto have anything to do with Trump’s slowly-gestating peace proposals after Trump recognised Jerusalem as Israel’s capital in December 2017. This week Trump gave up waiting – ending all future donations to UNRWA including $300 million pledged for this year. More than 2 million UNRWA registered Palestinian Arab refugees live in Jordan – most of whom have full citizenship. Nearly 370,000 – or 18 per cent – live in 10 refugee camps. The West Bank has nearly 775,000 UNRWA registered Palestinian Arab refugees – a quarter of who live in 19 camps. 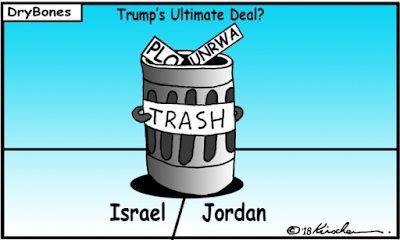 Trump’s proven propensity for financially helping those States that help him achieve his goals could well see a large part of this retired UNRWA funding being redirected to Jordan – if Jordan replaces the PLO and enters into direct negotiations with Israel on finally resolving sovereignty in the West Bank. Israel and the PLO have been unable to agree on the creation of an additional Arab State between Israel and Jordan after fruitless negotiations conducted over the last 25 years. Rejecting a Jordan-West Bank confederation now sees the PLO hoisted by its own petard– leaving Jordan to fill the yawning diplomatic void by stepping in and negotiating with Israel to engineer Jordan’s return to a large part of the West Bank – occupied by Jordan from 1948 until its loss to Israel in the 1967 Six Day War. Restoring Jordanian citizenship to the West Bank Arab population – as existed between 1950 and 1988 – would once again see parity of rights re-established between the Arab populations spanning both sides of the Jordan River. The 29 refugee camps in Jordan and the West Bank could be closed and their inhabitants integrated into the general population. “Palestinian refugees” would be relics of the past. No Arab or Jew living in the West Bank would be forced to move. Palestinian Arabs residing in other Arab countries could emigrate to this newly-merged Jordan-West Bank entity – which might even choose to rename itself “Palestine” – comprising as it would about 80% of the territory contained in the League of Nations Mandate for Palestine. Israel would end up exercising sovereignty in about 19 per cent – leaving sovereignty in the remaining 1 per cent – Gaza – to be determined by Israel, Jordan and Egypt. As with any good settlement – no-one would be 100 per cent happy – but 100 years of conflict would be ended and Trump would have pulled off yet another stunning success. for no reason, simply because they can.